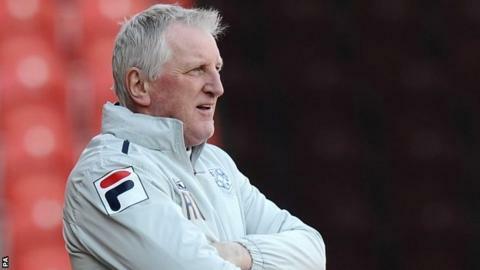 The Football League's bottom club Hartlepool have named former Rotherham and Oldham boss Ronnie Moore as manager following Paul Murray's short reign. Moore, 61, was in April after admitting to breaking Football Association betting rules and has been out of work since. His appointment comes on the same day as TMH 2014 Limited completed their takeover of Pools from Ken Hodcroft. Moore has appointed Sam Collins as his assistant at Victoria Park. "We believe that having Ronnie in charge will give the club the best possible chance of remaining in the Football League and we will provide him with all the support he needs to help him achieve that," said chairman Peter Harris, who is director of TMH 2014. "He is a very experienced manager, which is something we felt was needed but he's also a tough character who is very much prepared for the battle ahead." Can Ronnie Moore buck the trend at the Vic? Collins, also caretaker after Cooper's resignation, took charge of the 4-0 defeat by Burton on Saturday. Liverpudlian Moore took his first full-time management job at Rotherham 17 years ago, leading them to successive promotions to the second-tier in 2001. He inherits a Pools squad that have not won a league game since 11 October and are six points from third-bottom in League Two.